Well Red - a Liverpool FC blog: They think it's all over...is it b*llocks! They think it's all over...is it b*llocks! They skidded on the turf, embraced, punched the air and turned to face their jubilant fans. The Chelsea players had won...er...well, nothing actually. Not the match. Not the tie. Definitely not the Champions League. And yet there they were. All smiles. Frank Lampard clenching his fist at the deflated Kop. And the section of Anfield Road housing the Chelsea fans going wild. It was like they had won the European Cup. But then, they don't know what that feels like do they? OK, so they had snatched an equaliser in the 95th minute through a bizarre own goal from the hapless John Arne Riise - Liverpool's weak link and a player who has looked out of his depth at Anfield for at least a couple of seasons. OK, so they are now favourites because if they can keep Rafa Benitez's side out for 90 minutes at Stamford Bridge next week they are through. But, in a similar fashion to Arsenal in the quarter finals, didn't they make just a little too much of their celebrations? And we know what happened to Arsenal. 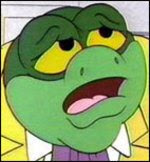 Chelsea deserved their luck, according to Lampard - a view echoed by Baron Greenback (aka Avram Grant). The sickly smile said it all. He thinks they've done it. He's already planning how to spend his roubles and taking vodka orders from his mates. In his mind they're in Moscow. And it's not just Chelski and their fans who have decided it's all over. The texts came in from gloating Evertonians within seconds of Riise's gaffe. The Facebook updates rubbed it in further. But me? I'm with Steven Gerrard. Asked if he was worried that Liverpool have never won at Chelsea under Benitez, he replied: "We haven't played there with Fernando Torres, have we?" My point exactly. There's 90 minutes to go. It's half time. We were the better team tonight and we can be the better team at Stamford Bridge. Big games need big performances from big players. Tonight, we played well. But Gerrard, and Torres, can do better. Much better. Let the Bluenoses snipe. And let Lampard and Grant count their roubles. Liverpool have already won in the San Siro against Serie A leaders Inter Milan in the Champions League. And - as if you need reminding - they've been in much stickier spots than this - and got out of it. Think Olympiakos. Think Istanbul. If anyone can win at Stamford Bridge and leave the doubters choking on their text message, it's Liverpool.